Diakont is pleased to deliver advanced underwater cleaning and decontamination services for reactor cavities. This service is performed using innovative robotic tooling to deliver safe, efficient, remote cleaning and decontamination of the refueling, component storage, spent fuel, cask loading, and other cavities, while flooded. The robotic cleaning can be performed in parallel with other operations and can reduce both personnel dose exposure and critical path schedule duration. 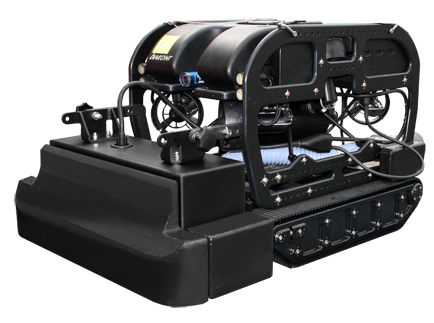 The key functional element of the Diakont cleaning tool is a hybrid crawler-ROV with an integrated cleaning system, remotely operated by a small team of Diakont field technicians from a control station on the perimeter of the refueling floor. Only a single technician is required at the side of the cavity to belay the umbilical. The tool transitions seamlessly during operation between ROV “flying” mode and cleaning “crawler” mode for maximal deployment flexibility and bridge-free operation. No adjustments to the tool are required during operation, including when transitioning between cleaning the cavity floor, walls, and complex shapes such as a drywell head. The tool attaches and drives along cavity and component surfaces using a high-force, no-flow vortex generator, even in the presence of RHR or shutdown cooling flow. Efficient, effective cleaning is performed utilizing rugged brushing action to detach the crud, while vacuuming it away at high flow rates to a submerged filter. Contact a representative to learn how Diakont’s solutions will help with your underwater decontamination needs.